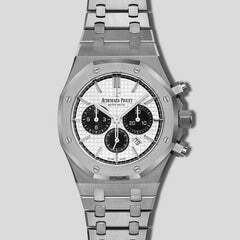 In 1993, the introduction of the Royal Oak Offshore brought about additional change, introducing a compelling new twist to the iconic Royal Oak. The Offshore pushed the boundaries of watchmaking even further, offering new materials, new sizes, and sportier functionality. The Royal Oak Offshore Chronograph, a dramatic timepiece with stopwatch functionality -- side pushers enabling you to stop, start, reset without interfering with the time. The openworked dial reveals a fascinating spinning tourbillon at 6 o'clock and the beautifully finished extra-thin movement found within. Selfwinding watch with chronograph function, hours, minutes, small seconds. 44 MM 18-carat pink gold case, glare-proofed sapphire crystal and caseback, 18-carat pink gold bezel, white ceramic push pieces and screw-locked crown. Sapphire dial, silver-toned counters, pink gold Royal Oak hands with luminescent coating, sapphire inner bezel, white rubber strap. 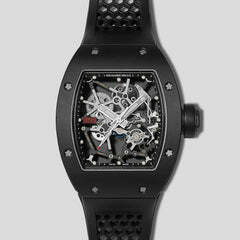 Water resistant to 100 meters with a 65-hour power reserve.